Well, we made it through our busiest time of the year! Thank God! Now we are starting our church fundraisers hot and heavy! Our church has already raised enough money and sent our Pastors to the mission field (India-please pray because they are still over there) and 10 members (ministers and wives) from our church went with them! We are now raising money for our Annual Youth Camp in June. I know your churches are busy with fundraising also and like us we need all the help we can get. 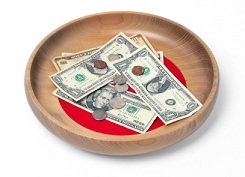 Is your church equipped with the Tips & Techniques of Church Fundraising? 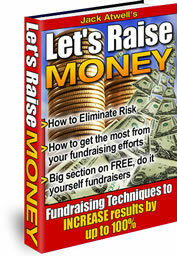 I'm recommending this great eBook Let’s Raise Money before your next church fundraising project. Are you getting the most out of your church fundraising efforts? You can create huge fundraising profits for your church, to build positive experiences in your community and to serve God’s Will. The opportunities are endless, but unless you equip your church volunteers with the fundraising tips and techniques your efforts may be exhausting and not successful. Get the whole community motivated to help you with your fundraising efforts such as close relatives and friends, business and social associates, people with a vest interest, recognized contributors or other organizations. Create different fundraising techniques that doesn’t involve having to use church funds up front by getting volunteers to put on an Outdoor Concert, Singing Telegrams, Raffle Tickets or other outings that just require volunteers time and not church funds. Sometimes you have to use church funds to get started but ask church members for donations first to help ensure the success of the your fundraiser. Most members will be more than happy to donate items (food, etc.) to help raise money for a worthy cause. I'm recommending this great eBook ”Let’s Raise Money by Jack Atwell to ensure that you and your church volunteers are equipped with the tips and techniques of fundraising before your next fundraiser. Big Section of FREE do it yourself fundraisers. How to Increase results by up to 100% with these great Fundraising Techniques & Much More. If you want the lasting knowledge and techniques contained in this book to help you be successful in your church fundraising click the link below. Click Here for the “Let’s Raise Money eBook! 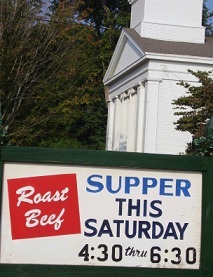 Click Here for More Church Fundraising Ideas! I have the wonderful Easter Bird Nests recipe that most children will either love eating or making them with their parents or classmates. 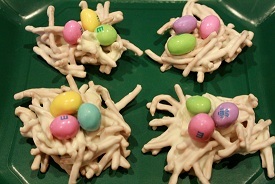 You can prepare these easy Easter Bird Nests before your Sunday School class and surprise them on Easter Sunday. The recipe is available free below - all you need is 4 simple items. The Easter Rice Krispie Eggs recipe is another fun easy recipe for Easter and will make your kids very happy. You can get creative and even form crosses out of the ingredients instead of eggs. Easter is a such a fun time for family and their children so try a recipe with your children and share the recipes with others. You can download these fun Easter recipes by clicking the link below. I will be adding new forms...and creating new web pages so don't miss an issue! Shepherdbase (church membership database) is affordable for small churches for only $34.99. You will also receive 2 Offering Envelope Templates and Offering Count Sheet free as a Bonus for purchasing Shepherdbase! Hurry and Enjoy these Savings! If you purchased Shepherdbase in the past (before Sept. 2011) and would like to receive the new updated version of "Shepherdbase" free of charge contact me. This great CD has all the free church forms, certificates, flyers...on FreeChurchForms.com along with 4 Bonuses as a Thank You for purchasing the CD all for one special price of $13.99 plus shipping and handling ($6.00 in the U.S. or $20.00 outside the U.S.). Free church forms, certificates, flyers...(430+ forms each in PDF and Microsoft Office Word format - some in Excel and Publisher). Also continually updated to include the latest forms created. Free Bonus - Expense Report in MS Excel format that will automatically calculate expenses. Free Bonus - Beautiful 12 Month Photo Calendar in Microsoft Office Excel format that you can easily automate any year you want with the click of a button and change any of the photos very easily on any month you choose. Free Bonus -ebook - "Top Ten Tips on How to Organize Your Office". The Church Office Package includes Shepherdbase - Church Membership Database and the FCF (Free Church Forms) CD along with all the Free Bonuses for only $40.99 plus shipping and handling ($6.00 in U.S. or $20.00 outside the U.S.)! Hurry and Enjoy these Savings! You can easily contact me through my email: terressa@freechurchforms.com. I will get back promptly with any questions you might have.